we remember the Berlin Wall. was glorious, bold, and expressive. of a chain-link fence, American Street, Philadelphia, PA.
Well said. Lovely image - a confident bold free form stroke! Thanks Danny! This I like - the graffiti and the poem. It reminds me that looks can deceive - that we sometimes overlook the bigger picture, or ignore it. And I agree, life can be messy. Freedom is not always pretty, rarely as you say. Do I prefer the un-conformed defiance or the law-and-order machine? Isn't this a political landmine? Or can the walls come down again and again for us to really see who's on the other side? What will it take to break down walls? Thanks again for making me pause. Danny, your photography has, for as long as I have known you, been wonderfully imaginative. Your prose and poetry, I find, is growing bolder, and as demonstrated here, whimsically punchy. Kudos! I continue to enjoy your photos and your prayers -- especially the prayer for today. A wonderful reminder of just how diverse God's creation really is. Bless you. 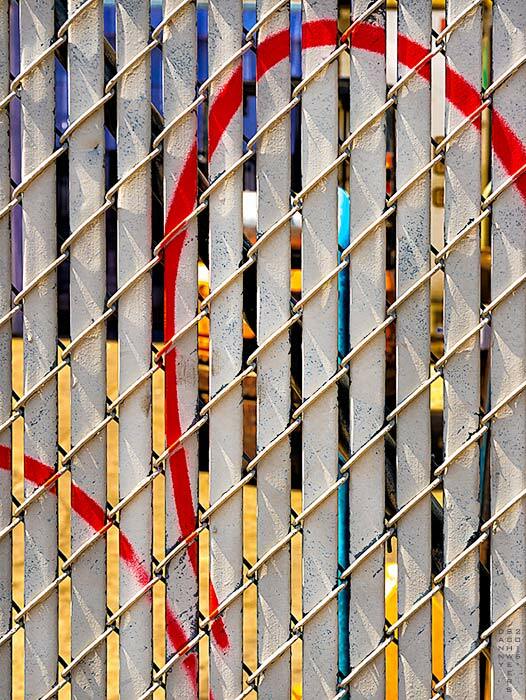 I enjoyed the recent photo prayer with the graffiti fence. Your explanation of the calamitously decorated West side of the Berlin Wall showing freedom, and the pristine East side depicting control and no freedom was a strong lesson. I so look forward to Wednesdays. On June 9, 2016, Westminster Presbyterian Church, Wilmington, Delaware sent this Photo Prayer out to everyone on its email list as part of their weekly email blast. On June 23, 2016, the Austin Sun blog posted this photo and prayer on its website and asked for these to appear regularly.